Haven’t decided on a hotel yet? You can look at other available hotels in the Burgundy region with Booking.com. Burgundy has it all: superb wine and gastronomy, medieval castles and abbeys, and a pastoral landscape that make for an idyllic French vacation. The region has always been a wealthy one. From medieval times, the court of the dukes of Burgundy rivaled that of the kingdom of France. It was also the center of medieval religious faith, and nowhere will you find such a wealth of Romanesque masterpieces of architecture as you will here. 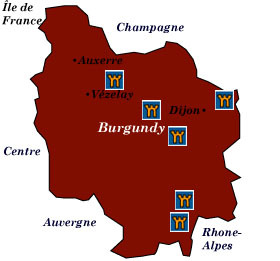 However, it’s the glorious Burgundy wine that attracts the faithful to come stay a while. A drive through its fertile countryside will soon convince you that it deserves its place as the heart of France. The wine. No introduction needed! Fall under the spell of one of the world’s most glorious wines throughout the region. You have hundreds of vintners to choose from. Start with the Côte d’Or, a famous wine route that runs from Dijon, through Beaune to Maçon. Dijon For 2000 years Dijon has been an important stop on the great European trade routes, as well as the capital of the once independent dukes of Burgundy. Many of the town’s monuments date from the Middle Ages, with the most noteworthy being the Palais des Ducs or Ducal Palace—now a major art museum (and one of the oldest in France), the Musée des Beaux-Arts. Vézelay One of the great pilgrimages of the Middle Ages extended across Europe, over the Pyrenees, and culminated at the glorious cathedral in Santiago de Compostela, Spain. Vézelay was one of the pilgrimage’s traditional starting points. In the 11th and 12th centuries, pilgrims paid homage to the relics of St. Mary Magdalene at the Romanesque Basilique Ste-Madeleine. Also at this site, St. Bernard made the call to the Second Crusade, and Vézelay was the rallying point for Richard the Lion-Hearted and King Philippe-Auguste during the Third Crusade. Today, Vézelay is a UNESCO World Heritage Site. Auxerre An ancient Roman river port, today’s Auxerre is a labyrinth of cobbled streets, which pass by Roman ruins, Gothic churches, and picturesque half-timbered houses. Rent a canal boat and drift along Auxerre’s waterways. Just 16 km. east is Chablis, where the surrounding vineyards produce one of France’s finest white wines. Beaune is often considered the wine capital of Burgundy. Within the stone ramparts, the old town of Beaune offers one of the best-preserved medieval centers in the region. The most obvious structure is the Hôtel-Dieu des Hospices de Beaume, in use as a hospice for 500 years. Autun Founded by Augustus Caesar, Antun was once one of the most important cities of Roman Gaul, with miles of ramparts, colossal gates, and a theatre, which could hold 15,000 spectators. Fortunes declined, but rose again in the Middle Ages with the building of the 12th-century Romanesque-Gothic Cathédrale St-Lazare. Cluny the village of Cluny is legendary for its 10th-century Benedictine medieval abbey. At one time the abbots were as powerful as the popes, and Cluny was a major center of the Christian empire, overseeing monasteries throughout Europe. Abbaye de Fontenay Founded in 1118 by St. Bernard, this remote abbey is one of the best-preserved in France. Now a UNESCO World Heritage Site, the abbey presents a fascinating insight into the lives of the austere Cistercian monks who once resided here.